A coalition of 13 first-generation and low-income student groups at 12 American universities sent a letter encouraging their institutions to reform the practice of giving legacy students preference in their admissions processes. Dartmouth, which does not have a student-led first-generation student group, does not appear on the list of signatories. Legacy students are those who have family members — usually parents — who are graduates of the institution. “There was not an independent group that could sign onto the letter when we reached out,” he wrote. Jay Davis ’90, director of the First-Year Student Enrichment Program, said that FYSEP aims to help meet the specific needs of first-generation Dartmouth students on campus. “First-[generation] is one of those interesting identities that cuts across demographics … I think that awareness of the issues that first-generation, low-income students face at all of our colleges is much, much higher than it was even four, five years ago,” Davis said. He added that Dartmouth likely did not sign the letter because FYSEP is not a student-run organization but rather a program organized by the College itself. While the College currently lacks a student-led group focused on the campus’ first-generation, low-income community, this might not be the case going forward. Marina Cepeda ’21 recently attended the 2018 1vyG Conference, organized by EdMobilizer, which aims to unite and provide resources for first-generation, low-income students across the Ivy League. She said that workshops were held to promote the development of a student-led organization for the College’s first-generation, low-income community. “We attended workshops, and they had lots of resources available to help us figure out how to start a community on campus,” Cepeda said. 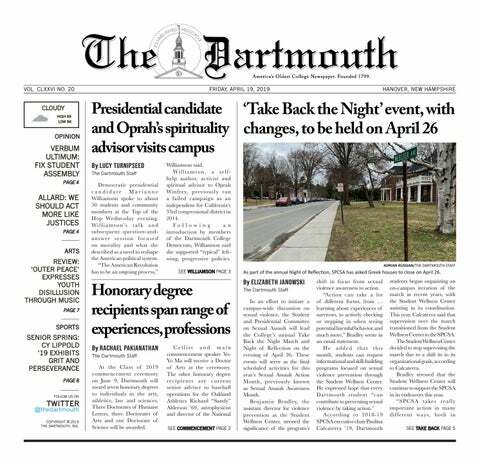 Cepeda said that Dartmouth’s exclusion from the coalition probably has to do with the lack of a strong first-generation, low-income community at the College, which, according to her, is due to administrative priorities. Nguyen wrote in a later email statement on Feb. 26 that the backlash against legacy preference in admissions stems from the fact that it is a practice mostly benefiting already-privileged populations and violates the core tenets of higher education. “It is a policy that provides a leg up to those who are already advantaged and goes against much of the ideals of access and meritocracy that higher education prides itself in,” Nguyen wrote. EdMobilizer was founded on the idea that giving first-generation, low-income students across institutes of higher learning could help enact policy change, Nguyen wrote. “Our coalition saw an opportunity for our collective voices to advocate for specific policy changes on the campus and national level,” he wrote. Nguyen also wrote that EdMobilizer plans to help advance the coalition’s cause by supporting student campaigns and being helpful in any way possible. The backlash against preference for legacy applicants is a nuanced topic and one that requires information and critical thought, according to an email statement from Brown University junior Joseph Vukel, director of business development for EdMobilizer and a treasurer for the 1vyG conference. Vukel wrote in his statement that he believes the future of change for first-generation, low-income students will be in careful partnerships among universities themselves, alumni and other groups.